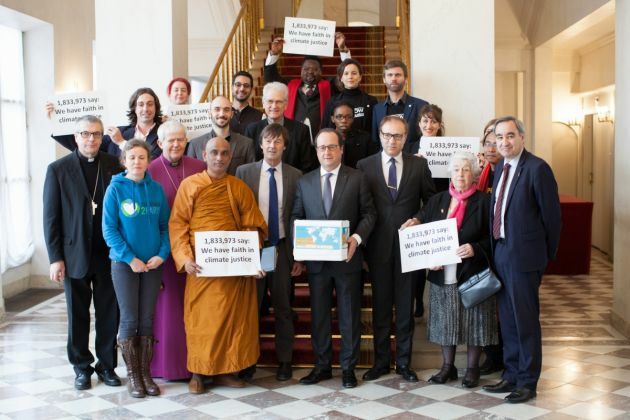 (Photo: © Sean Hawkey / WCC)During the UN COP 21 climate talks in Paris in December 2015, a delegation of faith leaders and climate change activists met with President François Hollande. French President François Hollande has praised Protestant churches and organizations for their work in areas such as health, social inclusion and support for refugees and migrants. The French president spoke to Protestant church leaders during an April 13 meeting at the presidential Elysée Palace with 300 Protestants representatives, Stephen Brown reports for the World Council of Churches. "You are present where others are absent," Hollande told the representatives of churches, foundations, associations and institutions belonging to the Protestant Federation of France and the Federation of Protestant Solidarity. Hollande also highlighted actions leading up to the United Nations climate conference in Paris in December 2015, "where we shared the same values." There are no official religious statistics for France but Protestants have been estimated at about 2 percent of the country's 64 million people, compared to 65 percent who describe themselves as Catholic and 6 percent Muslim. President Hollande defended his government in response to questions from five young people from French Protestant organizations on refugees, youth unemployment, people on the streets, those with disabilities and the place of religion in society. The Protestant Federation of France president, Pastor François Clavairoly, said in a speech it is "an important milestone along the path we walk together in society." This was good for, "for social cohesion, democratic life, search for direction, and service to our contemporaries, especially the poorest, the most vulnerable, excluded and most powerless." It was the first such large-scale meeting of Protestants with the current French president and came at a time of debate in France about the place of religion in society. French are often insistent on tightly to drawing the limits of the country's strict separation of religion and state, called "laicité" (secularity), dating back to aftermath of the French Revolution. Clavairoly warned against "a narrow 'laicité' which looks upon its citizens in a completely abstract way, without taking any account of culture, religion or human depth." In response, Hollande described laicité "as the freedom given to each person to practice the religion of their choice, on the condition that they don't impose it on others. It also allows each person not to be a believer." Referring to the Nov. 2015 terrorist attacks in Paris in which 130 people died, the French president underlined the role of religious leaders can play in promoting a message of social cohesion. "We all live in the same community, with the same rules. We live with the conviction that no religion can impose itself on others," said Hollande. The date chosen for the meeting at the Elysée Palace – 13 April – marked the anniversary of the Edict of Nantes signed in 1598 by King Henri IV. This accord granted a degree of toleration to Protestants and put a temporary end to the French wars of religion between Roman Catholics and Protestants. Earlier in the day, the city of Paris commemorated the Protestant victims of one of the most notorious atrocities of the French religious wars, the St. Bartholomew's Day Massacre of 1572. About 4,000 Protestants were killed during three days of mob violence in the French capital after King Charles IX authorized the assassination of Protestant leaders on Aug. 24, St. Bartholomew's Day. It was followed by killings throughout France of a further 10,000 Protestants. Paris Mayor Anne Hidalgo unveiled a plaque to commemorate the victims, describing the massacre as a warning against stigmatizing and repressing minorities which can lead to an "uncontrollable dynamic of extermination." In his address at the ceremony, Pastor Clavairoly welcomed the new official memorial to those killed in the massacre. The commemoration was an injunction, he said, to work for a "society that is willing to deal with and confront its differences and contradictions, not in violence but in debate and discussion,"
Clavairoly said the massacre was, "the tragic symbol of a stalemate in which a whole country gets locked and is unable to resolve matters except through what can be called a state crime or violence of a terrifying intensity that in the end becomes reciprocal." The Protestant Federation of France gathers about 30 churches and 80 associations and the Federation of Protestant Solidarity groups 360 organizations. Taken together they manage 1,000 social service institutions and services with a total of 28,000 staff and volunteers.